On occasion of the 100 birthday of the late Chilean President Salvador Allende, the Region of Liguria and the City of Noli organized a commemorative program. Prof. Alberto Peluffo, Vice Mayor of the City of Noli, Italy, asked me to write a personal testimony on the happenings around Pinochet Coup D’État. This is the English version of the text wich some parts were read by A. Peluffo to the public assisting to the act. Here is also included (Part II) a complementary text, based on my testimony as Pinochet’s prisoner at the Stadium and the Quiriquina Island camp. The public event in the City of Noli took place in Piazza del Commune the 15th of August 2008. 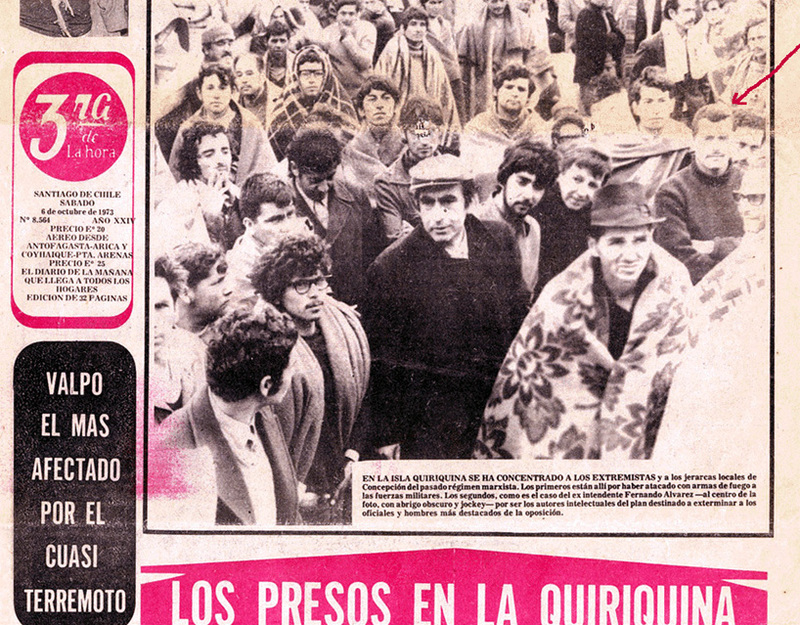 Combatants of the leftist organization MIR and from other leftist parties offered active resistance to Pinochet’s army on the 11th of September. However, the resistance to the military takeover was in general sporadic, with low firepower, and did not prevail. In other words it did not occur in the scale expected, or planned. We in MIR were some how psychologically prepared “for the moment to come” and for relevant activities, as we new (and even provided Allende with intelligence on the coup preparation) that the putsch was imminent. But the open direct resistance was crushed very soon, and also due to the brutality of Pinochet forces the core-militants did not succeed to encourage the mobilization of the vast majority of Allende supporters in order to take up the fight together. A third aspect was that Allende himself warned (on the 11 of September) the supporters that have elected him of not taking unnecessary sacrifices. I was in Concepción at the moment of the coup and at that time with assignment in the Organization detail of the Regional Committee, meaning that my “structure” was of a “central” kind. Three of the five members of the detail were captured. I spent times at different detention centres such as the Stadium, the Navy’s camp of prisoners at Quiriquina Island, the “marines” detention quarters at the Navy base in Talcahuano, and finally back to the Stadium in Concepción. Many died in these places either under torture or executed by firing squad. 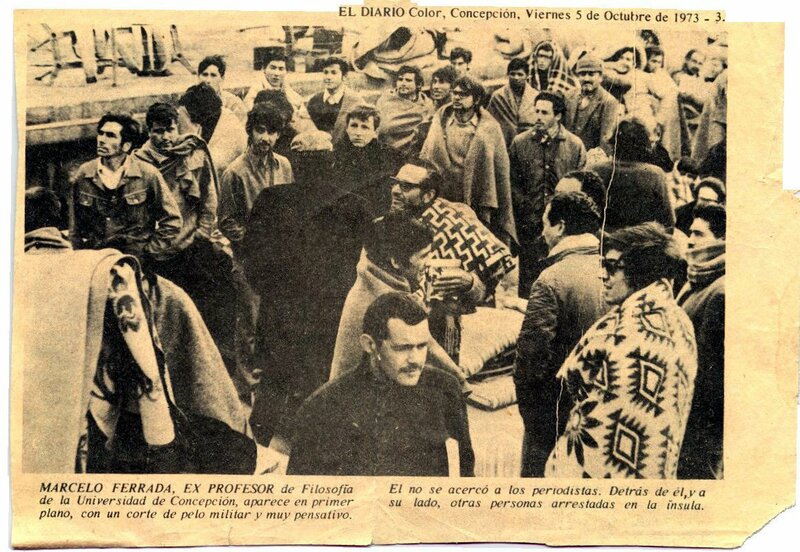 For instance, in the photo here below taken at the prisoner camp of Quiriquina Island and published in the front page of the mayor Chilean newspaper “Tercera de La Hora” (6 of October 1973), is mentioned the Intendente of Concepción Fernando Alvarez (head for the Regional government at the moment of the coup), at the centre of the picture. In fact, he died under torture at the camp in Quiriquina Island some days after that picture was taken. I am also depicted in the same photo, up right (signalled by the red arrow). The photo was taken at a visit of the Red Cross International at the camp, and for which I was to be thereafter considered as a “recognized” prisoner instead of risking “hidden” status. Three factors have contributed to obscure the real magnitude of the resistance on the 11th of September and the days ensued. One is the reluctance of the putsch leaders of acknowledging the true magnitude of their casualties. Doing this would have shown that the resistance was effective and thus motivating its continuation. A second factor is that the far most of the operations were of clandestine character. Also, due to the fact that all the press, all TV channels and all radio stations were seized the 11th and remained under the direct control of the military (not only by decree, but physically under control) it was not possible either to communicate eventual results of the actions. A third is the “factor seguridad” of the militants and units involved. As cadres become arrested in increasing numbers, the units or combatants acting with own initiative tightened security to keep knowledge of the actions to the absolute minimum, or even unknown. For instance, not even the closest members of our families, spouses, etc. would know or suspect what had really happened. This ignorance would save them too. And that silence continued for the years to come, no matter that many lived then in exile. However, an unequivocal recognition from the part of the military authorities on that the active resistance in Concepción took place in form of armed attacks is given in the text of the photo published in the front page of la “La Tercera” and showed here above (see translation below). they have attacked the Armed Forces with firearms >>. I was then 30 years old and a professor at the University of Concepción. Having worked previously as invited professor in Mexico with books published there, etc., I was released from captivity partly after direct demands from Mexican academic scholars and authorities (pressures and solidarity came also from colleagues in Italy and Germany), and partly after demands from my family which had strong tradition among the military. I was not set free in Chile but expelled from the country directly to Mexico from the prison, escorted to the airport by the military. In these days I become 65 years old (the 25th of July). 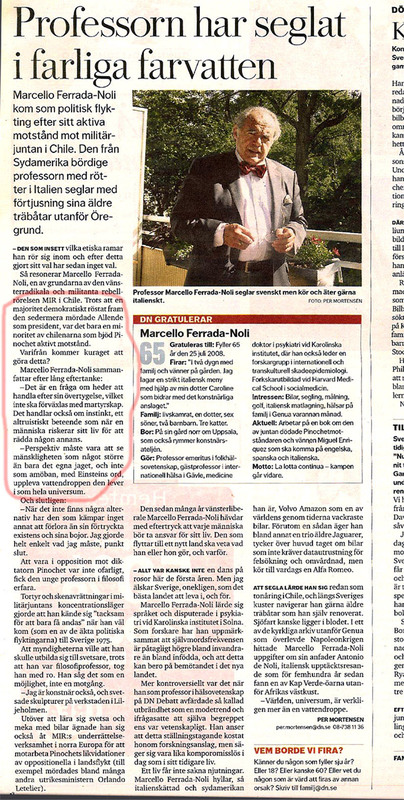 The main Swedish newspaper Dagens Nyheter (DN) had recently an article about some of the aspects mentioned above, in a public congratulation for my 65 birthday. The article was authored by DN staff-journalist Per Mortensen and published the 17th of July. The article (click here) is titled “Professor has sailed in dangerous waters”. In the article is also mentioned my Italian bond, Noli, and my Italian ancestors. Also my sailing/navigation along the Swedish coast issue in the article and thus the title and the connection the journalist made at the end of the text with Antonio Noli and Cape Verde. I marked for you in red one text of the article relevant to Allende and your specific question. The translation of the marked text is below the newspaper clip that follows. So reasons Marcello Ferrada-Noli, one of the founders of the militant left organization MIR in Chile. it was only a minority of Chileans which confronted Pinochet with active resistance. Where the courage to do this does comes from? his/her life in saving the life of another. by aircrafts based in Concepción. I dare to say that my odds were not the best. I was at that time member of the leadership of the association of university teachers and workers, which was my public political assignment. Besides, as a young university professor graduated in philosophy and recently having published a book  which – although its mainly philosophic content – I had expressly dedicated it to an Indian leader of the agriculture workers (Moises Huentelaf, who fallen death 1972 by the bullets of the powerful landowners of Southern Chile), I was indeed considered by the military among the so called “left intellectuals”. Not to mention I had published articles in the independent leftist magazine “Punto Final”. And “worst” of all, I have been one of the founders of MIR back in October 1965 and also co author, together with long-time friend Miguel Enríquez (MIR’s leader) and his brother Marco Antonio, of the first “Tesis politico-militar” of MIR approved in the constituent congress . Although no more than eighty people from all along Chile was present at the constituent congress of 1965, at the time of the coup, 1973, MIR had grown to thousands of supporters, and many of them core-militants. For the first time, I will also acknowledge here that my clandestine political role as MIR militant was member of the Organization Committee of MIR for the Region Concepción. From the Enríquez’s place I called the “central” but it was not operative that early. In the meantime we saw the army trucks, full lasted with soldiers, going in direction to the university campus. At aproximately10.30 I made finally contact and I was given a “punto” (meeting point) in Concepción downtown, specifically at the exit Maipú Street of Galería Rialto (if I remeber the name well), to receive details of the orders. 18th September 1973. Seven days after the coup, Tedeum in the Cathedral of Santiago. Pinochet and his Junta. Cardinal Silva Enríquez took however a rather distant position towards the Junta. After 35 years it is not possible to be exact without the documents in hand, but, as I recall in gross terms, the PME had among other items in its strategy these four moments to be implemented: a) MIR cells assigned for combat in down town were not to seize positions or barricade but to develop hit and run operations in multiple targets with the principal focus of distracting Pinochet forces from the combats in the “cordones industrials”. b) These so-called industrial cordons were the regions in the outer perimeter or outskirts of the city where factories were allocated, and also many “poblaciones” – the living areas of that time for the working class and the poor. Here it was previously organized, and predicted, severe resistance to the military forces. c) The cool mining workers from Lota and Coronel, cities near Concepción, were “expected” to cross Bio-Bio Bridge in a mass march (a political demonstration, not necessarily with arms) towards Concepción and thus reaching first the city’s periphery where the workers would unite with the people in the cordones. d) The battle would continue pushing the military towards the centre parts of the city and were they had their head quarters and also the three regiments were located. We could sum up that in that period the armed resistance to Pinochet’s forces was defeated, but not perished. I was taken first to the Stadium in Concepción. The morning after I was lined with two other prisoners waiting execution – right under the goal frame – by firing squad. One of the fellow prisoners was the former executive director of the state-owned SOCOAGRO in Chillán, and the other was a 16 years old worker from a “cantera” (sort of stone mine) caught with explosives apparently taken from the mine. I was recognised by a petty officer years before serving under my father’s command. I was saved, and it was not going to be the last time. See more details in the text below (Part II) of Anna-Leena Jarva, based on my testimony and other documents.